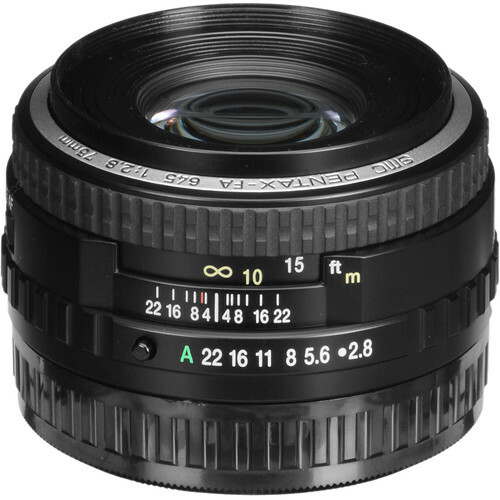 The smc FA 75mm f/2.8 Lens from Pentax is a standard or normal lens with a 35mm format equivalent focal length of 59mm and a 40.5 degree angle of view that closely approximates the human field of vision. The focal length allows a relatively simple 6 element/5 group lens design that produces sharp detail with a minimum of aberrations. The 75mm f/2.8 renders images without curvature of field found in wide angle lens or the flatness and compression found in telephotos. Its fast 2.8 maximum aperture is brighter in the viewfinder and allows low light shooting without hiking up the ISO, renders artfully blurred backgrounds and permits higher shutter speeds in standard lighting conditions. Box Dimensions (LxWxH) 4.095 x 3.937 x 3.78"
smc FA 75mm f/2.8 Lens is rated 4.8 out of 5 by 11. Rated 5 out of 5 by Paul S. from Versatile I purchased this kit lens as it seems to be referred to often at the same time I purchased the 645Z and am always surprised by the results for portraiture when I use it. I recently had to use it on location to do head shots for a law office, everyone is busy and they don't have time so with the cramp onsite space I was provided I chose this lens. Wide open the depth of field is shallow enough for good portraits and the focal length is just long enough that I'm not bothered by any wide angle appearance in the final product. This was the cheapest lens I purchased as part of my kit and probably the most versatile, overall I've been very pleased. Rated 5 out of 5 by Roy from amazing workhouse lens for the 645Z I am a full time professional commercial/fashion photographer and recently added the pentax 645z camera to my toolbox. It was quickly apparent that the selection of good glass was limited for the 645z. I bought the 55, 75, 120 and the 150 and have absolutely fallen in love with the 75. Its not quite as sharp as the 120 but that was easily corrected in capture one or lightroom. In the studio the 75 is a must for full body fashion/portrait work and on location its a fantastic walk around lens. Its sharp all the way to the corners, I notice very little vignetting and it weighs next to nothing. I was skeptical at first because it was so inexpensive but now its has quickly risen to the top of my goto lenses for work! Highly recommended! Rated 5 out of 5 by Udo from Surprisingly Good This lens really did surprise me and I did not expect it being that good. Comparing this lens to its medium format siblings made by other companies it is a real bargain with its relatively low price. Another bonus is its low weight. When attached to my Pentax 645D the autofocus is dead-on, center sharpness at open aperture is amazing, borders and corners sharpen up pretty well when stopping down. Maximum performance is reached between f5.6 and f8, f11 is still close and from f16 on diffraction takes its toll. There is just a tiny bit of CA in the corners in extrem front lighting situations which is easily removed. This extremely low level of CA contributes to my surprise as well. The color rendering is neutral. At the days back of film this lens was sort of kit lens being sold with the 645N bodies. And kit lenses were quite often said to be a cheap add-on just doing their job. But this lens (at least my sample) is a very good one. I am enjoying it. Rated 5 out of 5 by Maciej J. from I really like this lens This lens is small and light compared to most medium format lenses. I bought this as the first lens to use with my new Pentax 645Z. I was not disapointed. Resolution is great and the nice shallow depth of field at f/2.8 gives a very nice backgroung out of focus effect in portraits. Landscapes are also very pleasing. Rated 4 out of 5 by Ron from Solid, affordable performance Tremendous value for money. Though not fully metal. well constructed and quite sharp. Light and small as well. Hard to imagine a better value in MF. AF is reasnoably quick in decent ligth. My only real gripe is the MF/AF switch which is difficult to access, particularly when out in a snowy field in the cold. Rated 5 out of 5 by Mr. Nick Name from Excellent Small, lightweight, beautiful images, plenty of speed for a 645z. Rated 5 out of 5 by michaelezra from A superb lens Transforms 645z to a lighter camera. Lens is superb. does this lens come with a case and hood? No, it does not come with either a case nor a hood. Is this item brand new or used? The lens I bought was brand new in the factory box with all the requisite paperwork. I like this lens very much - it is fast and super sharp. I have used it for everything from portraits to some basketball action shots I was asked to take. Highly recomended. Answered by: Maciej J. M.
What are the part numbers for the lens hood and case for this please? Is this a used or new lens? Does this mount on PENTAX 645NII ? You can use this lens on the Pentax 645NII, yes. Is this lens auto focus or manual focus? Both. However, the AF is much louder and slower than I anticipated. would it work with Pentax 645Z? I use the FA 75mm f/2.8 on my Pentax 645Z. It is an excellent fast lens, very sharp. I have used it for basketball photos and portraits. This is a great all around lens. I see this mounts on the 645Nii; guessing that means this works on the 645n as well? The Pentax smc FA 75mm f/2.8 will be compatible with the Pentax 645N, yes.